On a trip to Shanghai last week we decided to visit the Power Station of Art, a newish space for contemporary art opened in 2012 to house the Shanghai Biennale. It has received a bit of attention from western media on the Guardian culture website and in an article on museums in The Economist and we were intrigued to see what it was like in the flesh. The view seemed to be that China likes building the ‘hardware’ – there were 2,000 museums in 2000 and nearly 4,000 by 2012 – but is not so good at the ‘software’, that is the content and its management. The newness of the Power Station of Art was manifest in the fact that the road given as its address didn’t show on any recent map we possessed. We made our own map from Google, found the nearest subway station and hoped for the best. As its name implies, the PSA is a refurbished industrial building, and its massive factory chimney makes it easy enough to identify once you emerge from underground. It is on the site of Expo 2010, now a windswept and rather bleak area of redevelopment on the west bank of the Huangpu River, south of the central area and the old city. As you get nearer the building, the familiar signs of contemporary art institutions begin to appear. 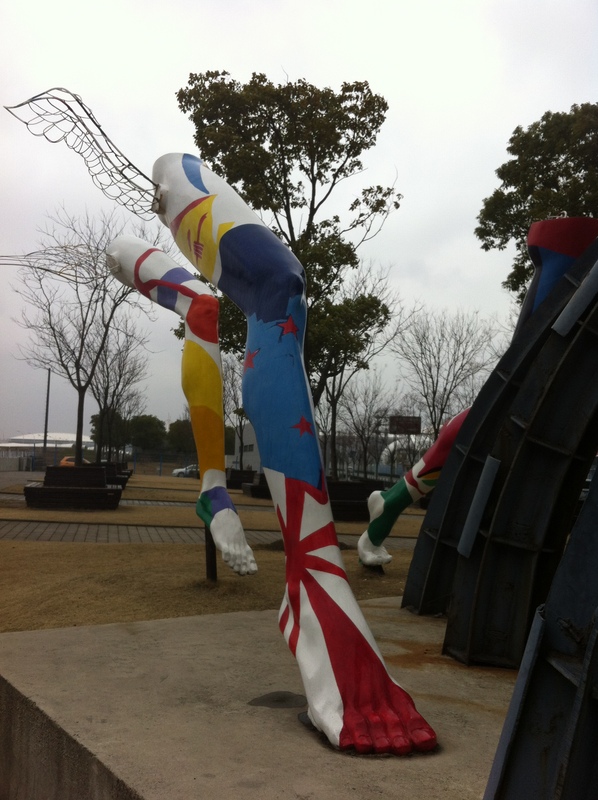 There is a huge, neon thermometer lit up on the side of the chimney and on the river bank, a set of flying, colourful moulded women’s legs greet you. Two huge inflatable monkeys mark the entrance, one hanging from the roof and one sitting by the door. Inside all sense of being in a specific country or locality disappears. You are in the world of globalized art. The huge inner hall is reminiscent of Tate’s Turbine Hall, while the inevitable shop is a clone of similar enterprises all over the world, from the mugs with the PSA logo to the art books and the high end artist designed jewellery. The interior has the mandatory escalators and there is no colour except black, white and grey. At first my heart sank. The building felt cold and empty. How depressing that every country as it becomes rich feels that it must emulate this one style. But we pressed on and looked at the exhibition, which was the response of many designers from all over the world to urbanisation. 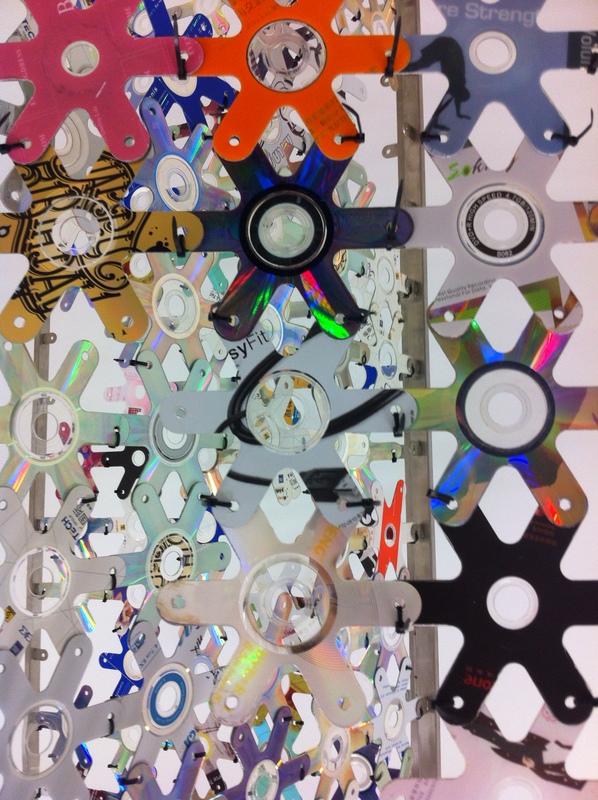 The playfulness of some of the exhibits won us round – the umbrellas of ‘Auto Gene’ that opened and closed by computer linked to ‘Singing in the Rain’ or the furniture screen made from upcycled and recut DVDs. A Dutch exhibit was a maze of blue polystyrene bricks and we suddenly came across a group of young Chinese students running in out of it, chasing each other and playing hide and seek. They shouted and whooped; the white cube environment didn’t seem to inhibit them in any way. The next day we sought out another recent space – Shanghai’s Museum of Contemporary Art – which is in the middle of the traditional Chinese garden section of People’s Square. This is again an adaptation of an existing building, but this time a greenhouse. It was recently built but didn’t attract enough visitors and was put up for sale. MOCA is a privately run, relatively small space and you can almost always see trees, sky and other buildings outside through the glass as you gradually rise up through the exhibition on a gently sloping walkway. This helps you to feel that you are in a specific location, rather than in Global Artland. All the more so for us, as from the terrace outside we could look across to where we’d had lunch in the restaurant on top of the old Shanghai race course building. The exhibition was a one woman retrospective by a Japanese artist Kusama Yayoi – an obsessive compulsive by her own definition. 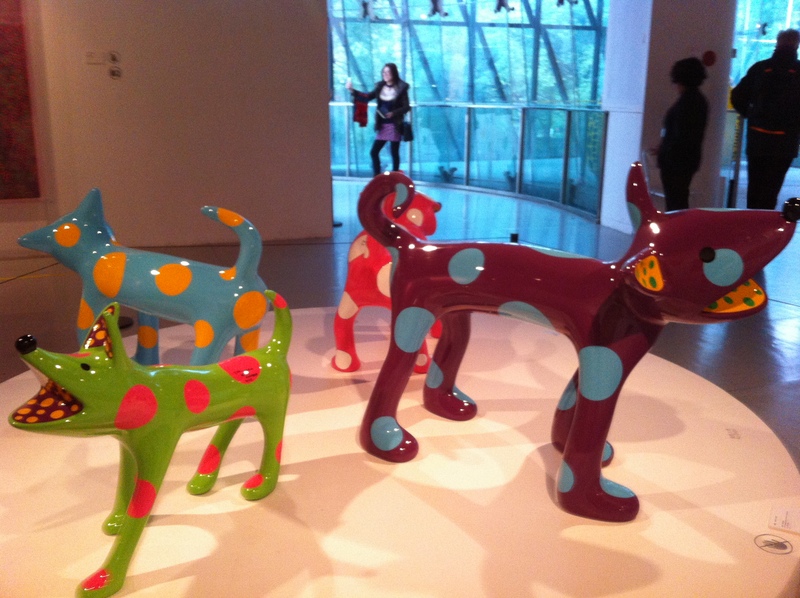 It was hugely popular (no sign of anti-Japanese nationalism here), and MOCA was swarming with young people – mostly young women – who were entranced by the brightly coloured, shiny plastic or resin sculptures of dogs, pumpkins, and giant flowers. They queued up happily to enter womb-like red tents full of mirrors and balloons covered in white dots. The favourite exhibit was a space where you entered to ‘obliterate’ the room and its contents with coloured sticky spots. Just as at the Power Station of Art, interaction was key to the audience’s enjoyment. Outside again, we sat on a bench in the gardens and watched the world go by. A young man was teaching his friend some self-defence moves, elderly people played cards, wrapped in heavy jackets and fur hats, a woman walked by with a radio blaring music – all absolutely normal activities in Chinese parks. Somehow the smaller scale and the context of MOCA, despite the fact that the exhibition was representative of global art, made the experience a lot more memorable. Hill Station: at ease with the past? For the past few days we have been staying at the Windamere Hotel in Darjeeling. This is a collection of bungalows built in the early twentieth century by British residents. The bungalows provided accommodation and sustenance for the tea estate managers, raj officials and other colonials who came up from the plains of Bengal to escape the heat. We have ‘full board’, which comprises a cooked breakfast, a potential five course lunch, afternoon tea, and another five courses for dinner. Dining and sitting rooms have coal fires and are crammed with photos of famous visitors and other memorabilia – letters from Nehru and Tagore. We have to embark on a punishing schedule of walking around the town to ensure we work up an appetite. This is easy, as Darjeeling is built on the steep sides of the lower hills of the Himalayas and the steps and winding narrow streets provide plenty of exercise. We have also risen at 4am to take a bumpy taxi ride to Tiger Hill so that we could see the sun rise over the biggest mountain in India, Kanchendzonga (28,000 ft) and catch a glimpse of Everest, which is about 100 miles away. The local man in charge of Tiger Hill spoke mostly in Nepalese, but made occasional comments in English, enough for us to understand that he was poking fun at the British, who had named Tiger Hill, despite the fact that there were never any tigers there. This and other experiences have made me think about the relationship that India has with its past and thence of how the past is perceived in China. For example, all the way to ‘Tiger’ Hill the taxi driver talked to me about his view of Darjeeling, West Bengal, the Indian Government etc. etc. He was of Nepalese origin, as are many people here, probably around 30 years old. He had very little positive to say about India and was on the side of having a separate state here – Gourkaland, as many signs call it. According to him, the central government takes all of Darjeeling’s wealth from its tea and timber and invests very little in hospitals and roads (the latter is certainly true). Indian tourists were a special target for his ire as they didn’t walk enough! He strongly approved of the British, especially their road building skills and commitment to education. Even now Darjeeling is renowned for its many schools. The ‘Toy’ Train which still operates and was made to bring the Raj up to the hill station from the 1880s was also praised. He pointed out to us the two raj era reservoirs constructed to serve the town and bewailed the recent spate of new buildings and over population which are leading to water shortages. The past is everywhere in Darjeeling, which was only a small village before the British introduced tea plants from China and developed the massive estates which have made it so famous. The houses in the upper part of the town look like suburban Surrey – or indeed West Bridgford. Our outings have taken us to the Botanical Gardens, established in 1878, or the Natural History Museum – of a similar age but sadly decaying. Just as we found in Delhi and Kolkata, modern India has absorbed these relics of its colonial past as best it can, or simply built around them or ignored them. The grand mansions erected for the Viceroy, Governor Generals or District Commissioners have become the residences of the Indian Government and its regional governors. More modest dwellings, churches or cemeteries have been left alone; some are looked after and displayed to tourists, some still get some use, others are gently falling apart. Not much seems to get knocked down; India seems to take an archeologist’s approach to development and prefers to add more layers to its material structures. This is all very different from China. There is very little that could be called ‘old’ in China. Modernisation and urbanisation in China seem to mean sweeping away the past and denying or regretting history. The narrative is that the arrival of Europeans began the century of humiliation. This was ended by the Communists in 1949 and it is their story that must dominate. The Cultural Revolution of course also destroyed much of China’s historical artefacts. Some famous streets and buildings in Shanghai are exceptions to this generalisation. The Bund and the streets leading from it preserve something of the 1920s and 1930s. We have stayed a few times in the Yangtze Hotel, which was built in the 1930s – probably about the same time as the Windamere Hotel. But actually it couldn’t be more different. While the Yangtze appears to be ‘old’, everything inside it is a modern replica. All the rooms are completely refurbished, to luxurious standards. You can take afternoon tea there, but it is served in a shiny, new restaurant and the food, while delicious, is not ‘authentic’ as it is in Darjeeling. The Yangtze has advantages, of course, especially in the bathroom and heating departments. Who would really want to go back to how things were in the 1930s, politically, morally or just in terms of sheer discomfort? But just for a few days I’m enjoying the fantasy and nostalgia offered here and I hope we’re bringing some tourist dollars to the local economy. I like the hot water bottles brought to our room at 7pm, just before dinner – and now I hear the gong for afternoon tea. Time for some more lemon cake and cucumber sandwiches, and Darjeeling tea.